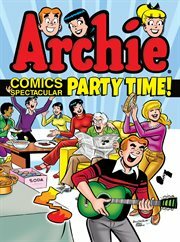 The item Archie comics spectacular, Party time!, (electronic resource) represents a specific, individual, material embodiment of a distinct intellectual or artistic creation found in Lawrence Public Library. Archie's throwing the most spectacular party of the century and you're all invited! Join Archie, Betty, Veronica, Jughead and friends as they dance the night away, party until the sun comes up, and try to clean up before their parents get home!